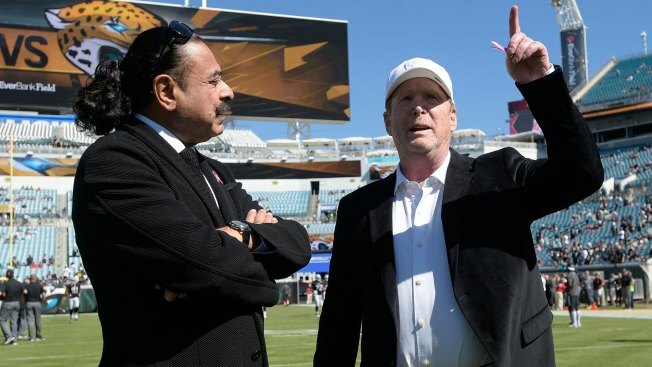 The Raiders are one of the few teams yet to put out an official statement in the wake of President Trump's remarks at a rally in Alabama on Friday. "About a year ago, before our Tennessee game, I met with Derek Carr and Khalil Mack to ask their permission to have Tommie Smith light the torch for my father before the game in Mexico City. I explained to them that I was asking their permission because I had previously told them that I would prefer that they not protest while in the Raiders uniform. And should they have something to say, once their uniform was off, I might go up there with them. Over the last year, though, the streets have gotten hot and there has been a lot of static in the air and recently, fuel has been added to the fire. I can no longer ask our team to not say something while they are in a Raider uniform. The only thing I can ask them to do is do it with class. Do it with pride. Not only do we have to tell people there is something wrong, we have to come up with answers. That's the challenge in front of us as Americans and human beings." According to the NFL Network, the entire Raiders offensive line plans to sit or kneel during the national anthem on Sunday in Washington. This season, first-year Raiders running back Marshawn Lynch has protested during the national anthem by sitting on a bench on the sideline. During the Raiders' preseason game against the Rams on August 20, linebacker Bruce Irving stood with his teammates but raised a fist in the air and quarterback Derek Carr placed his hand on the shoulder of edge rusher Khalil Mack. Afterwards, Carr insisted it wasn't a form of protest. "We're not doing anything like that. We wanted to show the kids that look up to me, look up to him, white kids, black kids, brown kids, blue, green, it doesn't matter -- all be loving to each other. We're best friends and we're loving to one another," Carr told reporters. "The only reason we did that was to unify the people that look up to us because obviously you see what's going on in the world. Obviously everyone pays attention to the national anthem nowadays. We just said that obviously this was the best time to do it while still honoring this country because I love this country. We're free to live here and play this game but we're also free to show that we love one another."